Justin Sullivan/Getty Images(NEW YORK) -- Facebook isn’t charging for poking, and “liking” a photo is still free on the social networking site. But these days, sending a private message to someone can cost anywhere from $1 to $100 – if you’re sending to someone like Facebook CEO Mark Zuckerberg, that is. “We are testing some extreme price points to see what works to filter spam,” said a Facebook spokeswoman. Last month, Facebook introduced “paid messages,” a feature where users pay a $1 fee to have their private message sent to an individual’s “strict filtering inbox” instead of an obscure “other” inbox. Before the change, Facebook users were allowed to send a private message free to someone they didn’t know or weren’t connected with. “Several commentators and researchers have noted that imposing a financial cost on the sender may be the most effective way to discourage unwanted messages and facilitate delivery of messages that are relevant and useful,” Facebook said in a Dec. 20 statement. Facebook told ABC News that the $100 private message offer is an experiment not just with Zuckerberg but to those with a significant number of subscribers. Remember, subscribers are people who aren’t your friends but can view the content you share with them because they follow you. Facebook calls these subscribers a broader group of friends. Since reaching 1 billion users last October, the social network giant has been revamping its privacy settings and changing the look and feel of the Facebook experience online and in mobile devices. Facebook is “testing extreme price points to eliminate spam” with its new messaging fee, the site said. As users become more acquainted with the new messaging fee, they’ll notice the number of messages received will be limited to a maximum of one a week. Facebook told ABC News there’s a lot of filtering happening resulting in getting the messages that are only meant for you, the user. As far as the reaction to Facebook’s new “paid messages” feature, Facebook offered no comment. David Paul Morris/Bloomberg via Getty Images(NEW YORK) -- Randi Zuckerberg, the former marketing director of Facebook and sister of the company's CEO, Mark Zuckerberg, was not happy at the end of her Christmas Day. A photo she posted to her Facebook account of her family -- including Mark -- playing around with Facebook’s new Poke app, ended up on Twitter. The photo was tweeted by Callie Schweitzer, a marketing executive at Vox Media, who thought it was a public photo on Facebook. Schweitzer followed or subscribed to Randi's public Facebook feed and thought the update was public. But it wasn’t. According to Buzzfeed and Randi’s tweets, Schweitzer was friends with another one of the Zuckerberg sisters and because she was tagged in the photo, Schweitzer was able to see it. “. @randizuckerberg demonstrates her family’s response to Poke #GAH,” Schweitzer tweeted along with the photo. It didn’t take long for Randi to respond. “Not sure where you got this photo. I posted it to friends only on FB. You reposting it to Twitter is way uncool,” she said on Twitter. Schweitzer clarified that she thought it was public, apologized and removed the photo promptly. But the photo wasn’t removed entirely. Many websites, including Buzzfeed, Business Insider, Mashable and Gizmodo, ran the photo. VentureBeat even said the Zuckerbergs are tripped up by Facebook’s privacy settings. The snafu illustrates something Facebook has started highlighting in its recent privacy controls overhaul -- that your Timeline is separate than other places on Facebook and that tagged photos can still be viewed by others. Starting last Friday, Facebook rolled out its redesigned and cleaner privacy tools. One of the additions included educational messages, which pop up when you untag a photo. The message tells users that the photo still might be visible by others. Peter Foley/Bloomberg via Getty Images(NEW YORK) -- Shares of Facebook dropped Wednesday upon news that employees can start selling restricted stock in the company. In all, 234 million more shares and stock options held by employees and executives at Facebook could potentially hit the market. CEO Mark Zuckerberg has made it clear he's not selling -- at least not immediately. He said he won't sell until next September at the earliest. Facebook stock has struggled since its IPO in May, but did see a boost last week when Facebook posted strong third-quarter earnings. Peter Foley/Bloomberg via Getty Images(NEW YORK) -- It's been long awaited and now the big milestone is here: Facebook has reached one billion users. The world's largest social network made the announcement Thursday morning in a status posting by its founder and CEO Mark Zuckerberg. "This morning, there are more than one billion people using Facebook actively each month," Zuckerberg wrote. "If you're reading this: thank you for giving me and my little team the honor of serving you." "Helping a billion people connect is amazing, humbling and by far the thing I am most proud of in my life," the statement continued. "I am committed to working every day to make Facebook better for you, and hopefully together one day we will be able to connect the rest of the world too." In an attached fact sheet, Facebook says the milestone was actually reached on Sept. 14 at 12:45 p.m. Pacific time. Since the site launched, the company says its one billion users have contributed to over 1.13 trillion "likes," 219 billion uploaded photos and 17 billion location-tagged posts, including check-ins. Justin Sullivan/Getty Images(SAN FRANCISCO) -- Mark Zuckerberg, the CEO of Facebook, admitted Tuesday that the company's stock has disappointed investors, and promised better results as Facebook's mobile app is made friendlier to advertisers. "The performance of the stock has obviously been disappointing," Zuckerberg said in an on-stage conversation with Michael Arrington, the founder of the TechCrunch Disrupt conference, where he appeared. "We care about our shareholders. We are excited about this mission of being more open and connected. Over the next three to five years the biggest question that is on people's minds is how well we do with mobile." When the company first sold stock May 18, it offered a price of $38 per share, but the stock quickly fell about 50 percent. On Tuesday, Facebook stock closed up about three percent to $19.43. Facebook's first big investor, board member Peter Thiel, sold about 20 million Facebook shares last month, but last week, Zuckerberg said he won't sell any of his stock for a year. The stock has stabilized since its initial fall, though it has not been over $20 per share in a month. Many stock analysts say that while Facebook, with more than 900 million active users, is giant, it is not an automatic money maker. Advertisers have complained they have less idea of whom they're reaching on Facebook than when they place ads -- attached to specific search words -- on websites such as Google. Moreover, they say, Facebook may suffer as people increasingly use mobile devices to access their Facebook accounts. Ads do not readily catch attention on a crowded smartphone screen when users are looking for Facebook friends. Zuckerberg promised to improve Facebook's mobile app. When Arrington asked him about future Facebook products, Zuckerberg focused entirely on mobile. He said the company's biggest mistake was the way the company had coded the apps, using HTML 5 computer language instead of native code. "We burned two years on it. It is really painful," he said of that decision. Facebook recently released a brand new iPhone and iPad app written in native code. Zuckerberg said the company is working on an app for Android phones, and said it "will be ready when it is ready." While Zuckerberg didn't reveal much about future company products or plans, he did say there is a dedicated team at Facebook working on improving search within the site, so that Facebook can function as a search engine, competing with Google. The interview ended with Arrington asking Zuckerberg if he is still having fun. "It's not about fun, it's about mission," Zuckerberg said. "I'd rather be in this cycle where they underestimate us. ... I just want to build good stuff." Facebook(PALO ALTO, Calif.) -- Florence Detlor, at 101 years old, is officially Facebook’s oldest user. And she has no hesitation being your “friend” if you want to be hers. But be warned, she’s quite the popular gal. Since Detlor’s personal visit Monday with Facebook founder Mark Zuckerberg and company COO Sheryl Sandberg, she currently has too many friend requests for the site to process new ones. Detlor’s age and Facebook activeness have garnered attention from the likes of Jay Leno and USA Today. She credits her newfound popularity as being the reason she had the opportunity to meet Zuckerberg and Sandberg in person. “They just called one day and said they wanted me to get to meet Facebook,” Detlor told ABC News. So off she went to visit the Facebook headquarters, which coincidentally is pretty close to her California home, where she was greeted by Zuckerberg and Sandberg for a personal tour of the social network’s campus. Detlor, of Menlo Park, Calif., said her favorite thing about being on Facebook is reading all the messages she receives. Since Detlor first joined the social network on Aug. 19, 2009, she’s tried to stay as active as possible on her page. She enjoys the access it allows to keep in touch with family. Detlor originally wanted to join Facebook so she could keep up with all the latest trends, and admitted she was intrigued with everything she’d read about Zuckerberg. She may not be the most technologically savvy Facebook member -- iPads have no direct correlation with Facebook -- but nonetheless, Detlor has gained tons of “friends” that support and applaud her efforts to stay hip. She had a word of advice for all the other older people out there too intimidated to join Facebook. “Get with it,” Detlor said. Did Mark Zuckerberg Stiff His Italian Waiter? Justin Sullivan/Getty Images(NEW YORK) -- Facebook’s newlywed and newly minted billionaire founder Mark Zuckerberg is being criticized after he reportedly skipped out on paying gratuity not once, but twice after dining out with his wife on the couple’s Italian honeymoon. Still, tipping waiters or waitresses is not customary in European restaurants because the wait staff typically earn a salary, and therefore do not depend on tips unlike U.S. wait staff. Because Americans are generally used to tipping when dining out, they tend to also do so abroad – earning a reputation as generous tippers by local Italian restaurateurs. So as it turns out, Zuckerberg may have just been following the old adage "when in Rome." That said, Shaw-Brown says Zuckerberg still could have plunked down a few bucks, especially since it's estimated that the Harvard drop out made an estimated $20 billion when Facebook went public this month. Zuckerberg and new bride Priscilla Chan married the weekend following Facebook’s May 17 initial public offering in a backyard ceremony that also celebrated Chan’s medical school graduation. Ironically, the first images from the pair’s honeymoon surfaced on Twitter, not Facebook. Justin Sullivan/Getty Images(ROME) -- Where do two newlyweds worth almost $20 billion spend their honeymoon? Rome, apparently. 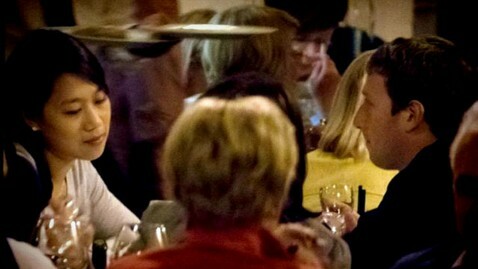 Facebook founder Mark Zuckerberg and new bride Priscilla Chan were recently spotted in the Eternal City enjoying a romantic dinner for two at Pier Luigi, where they dined on oyster and lobster pasta. The couple also reportedly hit numerous tourist spots. Ironically, the honeymoon images surfaced on Twitter, not Facebook. Longtime sweethearts Zuckerberg and Chan married the weekend following Facebook’s May 17 initial public offering, in a backyard ceremony that also celebrated Chan’s medical school graduation. Unfortunately, the honeymoon for the Facebook IPO, one of the most highly anticipated of all time, might be over. Its share price has tumbled, and lawsuits are building amid accusations that banks gave select investors inside information about the company’s potential profitability. And Zuckerberg’s net worth has taken a significant hit, too. Justin Sullivan/Getty Images(PALO ALTO, Calif.) -- Facebook founder and CEO Mark Zuckerberg married Priscilla Chan on Saturday, two days after the social networking site had the biggest tech IPO in history and five days after the bride graduated from medical school. The wedding was announced, of course, on his Facebook page, along with a photo of the happy couple, and in less than an hour nearly 200,000 people had “liked” the news. Zuckerberg, 28, and Chan, 27, who met nine years ago at Harvard, married in a small ceremony in the backyard of his home in Palo Alto, Calif. Chan graduated from medical school at the University of California, San Francisco, on Monday, the same day Zuckerberg turned 28. A guest authorized to speak by the couple said there were fewer than 100 people at the ceremony, and they all thought they were there to celebrate Chan’s graduation. Zuckerberg designed the simple ruby wedding ring himself, and Chan had not seen it before the ceremony, the guest said. The couple had been planning the ceremony for four or five months, the guest said. The wedding feast came from the couple’s favorite Palo Alto restaurants, Palo Alto Sol and Fuki Sushi, and for dessert they had Burdick Chocolate “mice,” which Chan and Zuckerberg had on their first date. Facebook(NEW YORK) -- Facebook’s stock market debut seems to be creating a frenzy everywhere but at Facebook. Shares closed at $38.23 after fluctuating between $40 and $42 for most of the day. Gizmodo reported shares were trading at a record-breaking 2.7 million per second within the first 30 seconds of trading. But after founder and CEO Mark Zuckerberg, Facebook COO Sheryl Sandberg and a throng of cheering employees rang the Nasdaq opening bell from the company headquarters in Menlo Park, Calif., at 9:30 a.m. ET Friday, the campus became a ghost town. Nightline anchor Bill Weir talked with Justin Mitchell, a Facebook engineer, and Donna Gutman, who worked in Facebook’s user operations, in New York City’s Times Square shortly after trading began. Both said they had been with the company for more than four years but had recently quit, taking stock options with them. On Thursday night, Facebook priced its initial public offering at $38 a share, selling $16 billion worth in equity and valuing the company at $104 billion. It’s the largest tech IPO of all time. All Facebook employees are stock holders, Mitchell told Weir. So why isn’t he out buying a Ferrari? One of the big questions is, now that Facebook has gone public, will it have to tailor user experience to meet shareholders’ expectations. But Mitchell said he thought Facebook’s IPO filing would have little effect on how it does business. Thursday night, Facebook celebrated its newfound wealth with a wild bash at company headquarters that only Facebook could throw -- a “Hackathon,” an all-night, a code-writing “rager,” where Facebook employees worked on their own special projects until the morning light. They do one every couple of months, according to the company’s blog. Those projects are what Facebook deems important, Gutman said. “I think that the company needs to keep doing what its doing and the work people did last night shows that’s what people are focused on,” Gutman said.